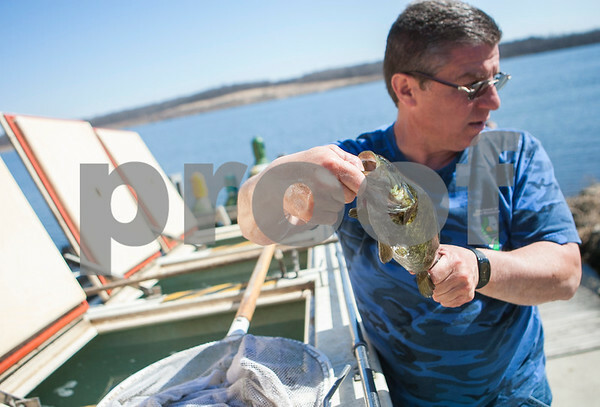 Bob Cox, IDNR Tech 2, holds up a smallmouth bass for the curious group of anglers at Shabonna Lake State Park who came to see the release of 269 eight year old smallmouth bass into the lake of Wednesday, April 1, 2015. The broodstock of bass came from Jake Wolf Hatchery in Topeka, Illinois. Cox said the fish ranged in weight from about 4 to 7 pounds, all of them trumping the Shabonna Lake smallmouth bass record fish of 3.40 lbs, caught last May.